The Rookie-level Gulf Coast League Nationals must have felt such a high from their Sunday opening performance that they replicated it in the finale. 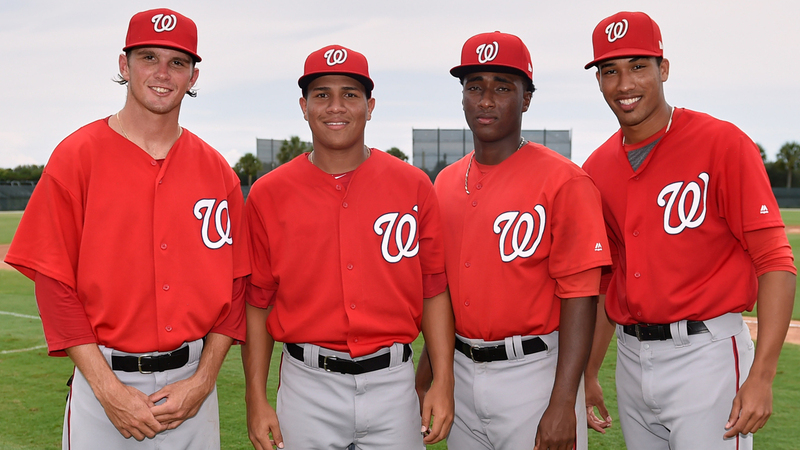 Four Washington prospects combined to pitch back-to-back no-hitters as the Nationals swept their twinbill from the Marlins, 4-0 and 1-0. Washington's No. 21 prospect Joan Baez set the tone in Game 1. Working his way back from an undisclosed injury that landed him on the Class A Advanced Potomac disabled list on June 4, the right-hander faced just two batters over the minimum in six innings. Baez struck out seven, walked one batter and hit one with a pitch. His fourth GCL outing lowered his ERA at the level to 1.47 through 18 1/3 innings. After Baez's departure, Jose Jimenez finished off the first no-no. The left-hander walked Cameron Baranek to lead off the bottom of the seventh, but got J.D. Osborne to hit into a double play before inducing Albert Guaimaro to fly out to right field to end the game. Less than 30 minutes later, Jared Johnson started the second historic game. In his second start, the southpaw struck out two and walked one over four innings before giving way to Gilberto Chu. The lefty allowed just one baserunner, when Jan Mercado reached on a throwing error by shortstop Yasel Antuna, but was otherwise perfect. Chu struck out four without a walk, fanning Baranek and Guiamaro for the afternoon's final two outs. The no-hitters were the first in the Gulf Coast League this year. Miami's No. 2 prospect Tyler Kolek got the start for the GCL Marlins in Sunday's opener and threw one inning. He walked two without a strikeout but didn't allow a hit. It was Kolek's second outing in his return from 2016 Tommy John surgery.